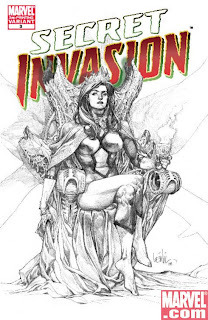 The comic book blockbuster event of the summer, Secret Invasion, continues to have everyone asking, “Who do you trust?” Marvel is pleased to announce that Secret Invasion #3 will have a third printing featuring a black and white Spider-Woman cover by superstar artist Leinil Yu! Join award-winning writer Brian Michael Bendis as he presents Secret Invasion #3 (of 8) Third Printing Variant, as the epic invasion of the century rages on! It’s time for the new graduates of the Initiative to show the world what they’re made of but they aren’t the only new recruits. Nick Fury has returned and with him a batch of fresh faces. Are Nick’s new Secret Warriors enough to push the Skrull horde back into space? Marvel urges retailers to check their orders on Secret Invasion and all tie-in issues, as they continue to sell out quickly at Diamond! It’s the series you’ve read about everywhere from Entertainment Weekly to The Wall Street Journal--don’t miss Secret Invasion!